There are many different types of carrot to choose from. Stump-rooted and finger-sized carrots are quickest and may be grown in small pots, or in heavier soils that would cause longer roots to fork. Medium or long-rooted carrots can be grown in lighter soils or in raised beds or deep containers filled with compost. Maincrop types are perfect for sowing later in spring to produce roots for winter storage. Carrots don’t just come in orange! Try one of the many colourful alternatives, including purple, yellow, white and red roots. 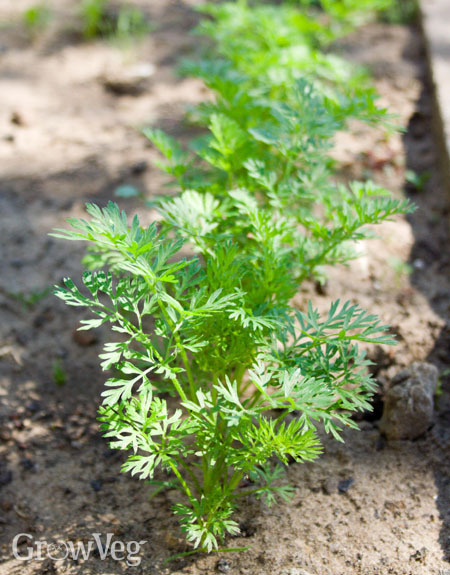 Sow carrots from early spring to midsummer to be lifted from late spring to early winter. Stored roots will tide you over until the following spring. Make the earliest sowings of fast-growing early varieties into greenhouse or polytunnel beds, or pots kept under cover. You can also sow earlier outside by using low tunnels or cold frames. Our Garden Planner can help you to work out exactly when to start sowing. Simply select and drop in a row or block of carrots, then click the accompanying Plant List for sow and harvest dates based on your location. Adding crop protection, for instance a row cover tunnel, will adjust sow and harvest dates accordingly. Click back to the Plant List and you'll see that the dates are now a half-month sooner than the carrots without protection. To sow into tubs, fill containers with potting compost then gently tamp down to firm. Sow the seeds very thinly over the top, then cover with a quarter inch (1cm) layer of potting compost. Water, then label. Carrot flies or rather, their maggots, are notorious for damaging the roots. To thwart this low-flying insect cover the ground with a row cover or fleece immediately after sowing. Take care to secure the edges of the cover so there are no gaps. Keep covers in place throughout the life of the crop. Any clumps of seedlings can be thinned out as necessary by very carefully pulling any excess out. This can, however, dislodge the roots of neighbouring seedlings, so alternatively you can use scissors to snip off the foliage instead. Do this on a still day to prevent the carrot smell alerting nearby carrot flies. Sometimes carrots can run to seed (bolt) before they’ve had a chance to form their roots. Keep the soil moist in dry weather to help avoid this, and regularly remove weeds to minimise competition for available moisture and nutrients. Carrots don’t normally need additional feeding, but occasional mulching with a light-blocking organic mulch such as compost or leafmould will help prevent the tops turning green.